I've been using Unity 3D for months now and I somehow missed Gizmos as a concept. I had seen the camera and speaker icons in the editor view but I think I had just assumed they were built in symbols used for built in objects and I had a blind spot towards them. I now know better. 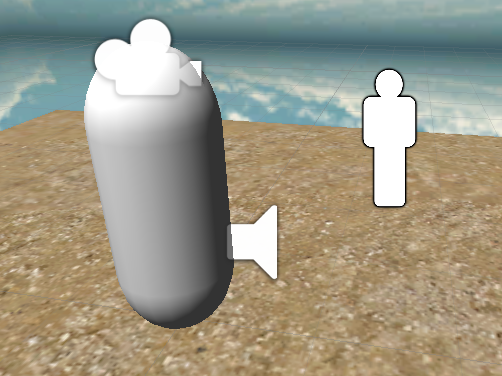 You can easily create your own icons which can be included in the scene. I started using them when I wanted to make spawn points visible in the scene. It is very easy to attach your icon to any object in a scene and that icon displays over the object. That works well if you want to mark otherwise invisible points in your scene. An example of this might be waypoints for AI controlled characters. I prefer to create the Gizmos in code. This adds them to the Gizmos list in the game view. This can be done in any image editor and just needs whatever shape you want with a transparent background. The image can be any size if you intend to use the default automatic scaling method. For good quality I use anything between 512 and 1024 pixels high or wide images. If you don't use the automatic scaling the image in the 3D scene, at those sizes, is quite small. I used Inkscape to create the following image. 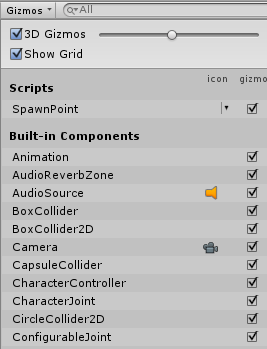 The important bit to know before you can use the image in your code is that it must be in the special Gizmos folder in Unity. There can only be one Gizmos folder and it must be in the root of the Assets folder. If you try to put your icon anywhere else, it will not work as a Gizmo in code. Well if you can write any Unity code this is the simplest possible. Just add the following in the code for your object or create a small script with this in. // folder in the root of Assets. That's it, you now have a Gizmo shown wherever you position that object.